Reading and share top 19 famous quotes and sayings about The Better Person by famous authors and people. 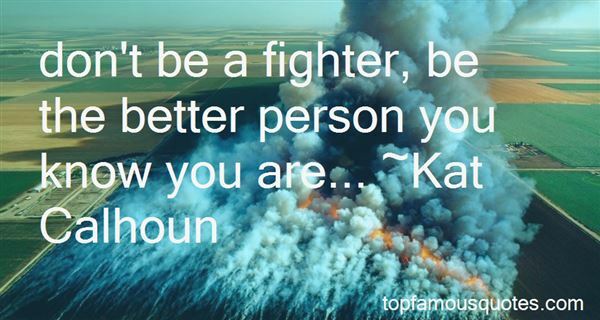 Browse top 19 famous quotes and sayings about The Better Person by most favorite authors. 1. "The narratives we create in order to justify our actions and choices become in so many ways who we are. They are the things we say back to ourselves to explain our complicated lives. Perhaps the reason you've not yet been able to forgive yourself is that you're still invested in your self-loathing. Perhaps not forgiving yourself is the flip side of your stealing-this-now cycle. Would you be a better or worse person if you forgave yourself for the bad things you did? If you perpetually condemn yourself for being a liar and a thief, does that make you good?" 2. "I want to be a better person in every aspect. I really don't feel I've in anyway fulfilled my potential in every area of my life. But I'm optimistic." 3. "Apropos of nothing at all except that it has been on my mind and I think I had better say it because it accounts for a good deal of my behaviour. There is a strong streak in me that wishes not to exist and really does not believe that I do, so that I tend to become unnerved when these curious ideas are proved to be not really true because someone (in this case you) has responded to something I have said or done just as if I were an actual person the same as you (especially) or anyone else. Some of it is, I guess, just the worst sorts of arrogance and irresponsibility , but not all of it, as I really don't think I exist a lot of the time, so I'm asking you to bear with it, me, whatever, for the sake of what?—friendship I suppose, which I want to be capable of, which is obviously not enough. More brains might help, but enough unseemly remarks for eight o'clock in the morning and the shivering in pyjama bottoms syndrome." 4. "-On sharing the love story of the Persian prince Khushraw and the niece of the queen of Armenia Shirin (who were looking for each other but in opposite directions): "Both lovers then departed, looking for each other in opposite directions, a theme universal in its pathos, because we all spend our brief lives doing just that, even if we physically share our beds with the same person every night for years. Always we carry an image in our head of a better person, of an ideal person, which blurs our chances of finding happiness." 5. "Beauty can make you powerful in a way that isn't good for you. Being OK is better for the person I have become." 6. "Psychotherapy works for the treatment of depression, and the benefits are substantial. In head-to-head comparisons, in which the short-term effects of psychotherapy and antidepressants are pitted against each other, psychotherapy works as well as medication. This is true regardless of how depressed the person is to begin with. Psychotherapy looks even better when its long-term effectiveness is assessed. Formerly depressed patients are far more likely to relapse and become depressed again after treatment with antidepressants than they are after psychotherapy. As a result, psychotherapy is significantly more effective than medication when measured some time after treatment has ended, and the more time that has passed since the end of treatment, the larger the difference between drugs and psychotherapy." 7. "Being able to do lead roles in pictures or onstage or whatever it is that you're doing in acting is obviously what you strive for because you want to better yourself as an actor and you want to better yourself as a person as well. But that does come with a lot of responsibility and a great deal of weight." 8. "Danny had no idea what the thing was. All he knew was that he lived more or less in a constant state of expecting something any day, any hour, that would change everything, knock the world upside down and put Danny's whole life into perspective as a story of complete success, because every twist and turn and snag and fuckup would always have been leading up to this. Unexpected stuff could hit him like the thing at first: a girl he'd forgotten giving his number to suddenly calling up out of the blue, a friend with some genius plan for making money, better yet a person he'd never heard of who wanted to talk. Danny got an actual physical head rush from messages like these, but as soon as he called back and found out the details, the calls would turn out to just be about more projects, possibilities, schemes that boiled down to everything staying exactly like it was." 9. "Although my understanding of exactly how much trouble I was in grew more specific over time, as a child I surely understood enough about my condition to know it was something I'd better keep private. By intuition I was certain that the thing I knew to be true was something others would find both impossible and hilarious. My conviction, by the way, had nothing to do with a desire to be feminine, but it had everything to do with being female. Which is an odd believe for a person born male. It certainly had nothing to do with whether I was attracted to girls or boys. This last point was the one that, years later, would most frequently elude people, including the overeducated smarty-pants who constituted much of my inner circle. But being gay or lesbian is about sexual orientation. Being transgedered is about identity." 10. "Someone who was happywould have little need to hope for change. But, conversely, an optimistic person was that waybecause he wanted to believe in something better than his reality.He started wondering if there were exceptions to the rule: if happy people might be hopeful, if theunhappy might have given up any anticipation that things might get better." 11. "If you currently travel abroad or plan to in the future, make sure you understand the cultural convention of the country that you are visiting. Particularly with regard to greetings. If someone gives you a weak hand-shake, don't grimace. If anyone takes your arm, don't wince. If you are in the Middle East and a person wants to hold your hand, hold it. If you are a man visiting Russia, don't be surprised when your male host kisses your cheek, rather than hand. All of these greetings are as natural as way to express genuine sentiments as an American handshake. I am honored when an Arab or Asian man offers to take my hand because I know that it is a sign of high respect and trust. Accepting these cultural differences is the first step to better understanding and embracing diversity." 12. "It's hard to deal with people in life that think that their better than you because they got everything they want, better things than you, bigger house, ect. 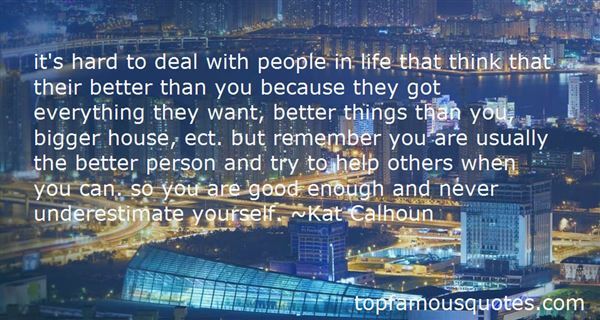 but remember you are usually the better person and try to help others when you can. so you are good enough and never underestimate yourself." 13. "Don't be a fighter, be the better person you know you are..."
14. "I am not always certain that it is I who am the better person, ma petite, but together we are the better person." 15. "Up until that moment, I'd been at the earliest stage of love, when you feel it will turn you into the better person you want to be. Now, his gentle voice and sage advice took me to a later stage: I felt I needed to pretend to be a better person than I was so he'd keep loving me. This was hard because it made me hate him." 16. "I wasn't perfect, and I made mistakes; but I learned from them and became a better person for it. I always followed my heart. And most of all, I loved — with every ounce of my being. I guess you could say the greatest love story ever written isn't confined to the pages of a book. It's in our lives; and we're the ones who write it. So that's what life's all about, isn't it? Why we're here. It has nothing to do with dollars. In fact, it's totally free. Life's greatest gift. And the best part is, the best part, this gift we give to others… we get it back. It's what makes the journey so worthwhile… it's LOVE." 17. "Never give up on someone. Sometimes the answers you are looking for are the same answers another person is looking for. Two people searching together are always better than one person alone." 18. "Pain or perspective, that's the choice.'. . . You choose pain - you choose to fight it, deny it, bury it - then yes, the choice is always hard. But you choose perspective - embrace your history, give it credit for the better person it can make you, scars and all - the choice gets easier every time." 19. "But what feels better, after a taxing day that pushes you to the brink of the strong person seen by everyone but yourself, a day that reinforces your belief that you are, in fact, weak and incapable? What feels better in that moment than to be held, to be loved, to bare yourself to someone else and know you're accepted?This is what I saw in Dominic's gaze as he stood before me, then – a single-minded, stalwart power behind his ever-deep eyes that said he needed more than words and perfunctory touches the likes of which most family members could just as easily provide." If a train is coming at you, closing your eyes won't save you ... but if you look right at it, you at least have a chance to jump."